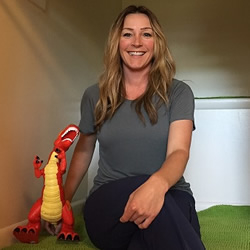 When speech therapist Michelle Lance starting working with the Idaho SBDC in Pocatello, she was working full-time as a speech therapist for a clinic. As she watched management struggle with employee relationships and effective service delivery, she saw ways to better run a clinic. She had a hunch the market could support a new speech therapy clinic, and her specialties were in demand. Over the next year, Lance worked with the Idaho SBDC to develop a business plan and secure an SBA loan. She also worked with a group of Idaho State University students on market research. In the fall of 2016, Lance opened the Bloom Center for Pediatric Therapy, hired an additional therapist, and now sees kids 0-18 years old on a full schedule. She continues to work on expanding and renovating the spacious facility she purchased and plans to add more services as she grows. For more about the Bloom Center for Pediatric Therapy, visit www.bloomidaho.com. For more about the Idaho SBDC, visit idahosbdc.org.